I’m seriously committed to using this Farmer’s Wife cookbook for awhile, and I’ve gotten rave reviews so far. My budget is also singing the praises of these recipes. 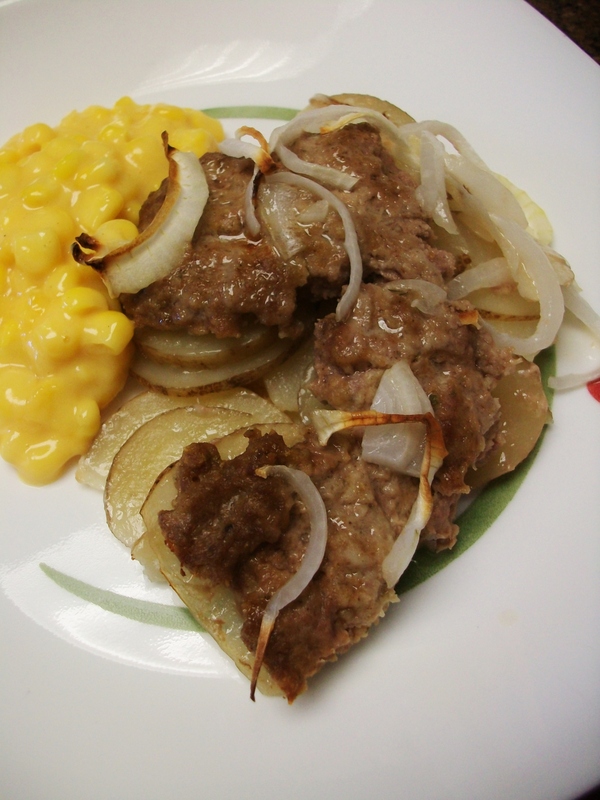 Here’s the Meals with Margaret version of hamburger casserole…. Thinly slice four large baking potatoes. Layer in the bottom of a greased 9 x 13 dish. Sprinkle with garlic salt. Press hamburger mix into thin patties and piece together to make a layer over the potatoes. Top hamburger with one thinly sliced onion. Pour 1/2 cup of milk over all and bake at 325* for one hour. This was totally satisfying and totally easy! You could sneak cheese into the potato layer if you’d like, and the potatoes would be stellar with real cream poured over the top instead of the skim milk I used. This is enough to feed a family, and I don’t think you will have complaints (unless you have onion-haters!). Posted in CasseroleTagged casserole, Cook, Easy, farmer's wife, food, hamburger, inexpensive, onion, potatoes, recipeBookmark the permalink.